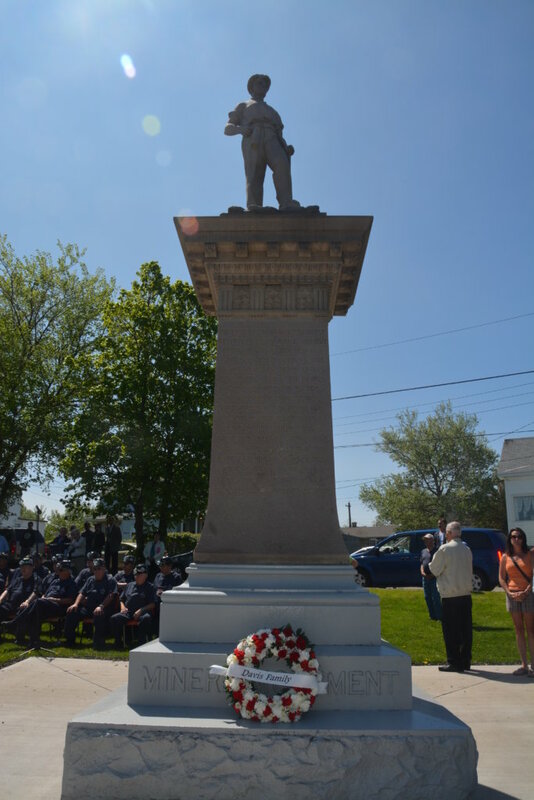 Every June 11th, the United Mine Workers of America observe William Davis Miner’s Memorial Day (Davis Day) in honor of Nova Scotian William Davis who was killed when company guards fired into a crowd of striking miners near the town of New Waterford in Nova Scotia, Canada. William Davis was 37 years old at the time of his death. Davis was a father to nine children with a 10th on the way when he died. He previously worked in Springhill mine where his older brother Thomas died at the age of 14 in the mine disaster in 1891. Today marks the 93rd anniversary of his murder which took place at approximately 11:00 AM on June 11, 1925. This year the annual event was held in New Waterford, Nova Scotia with a memorial service at 10 a.m. at the Calvin United Church on Hudson Street. Secretary-Treasurer Allen and International District 2 Vice President Yankovich spoke at the event with Canada’s Auditor-Teller Emeritus, Bobby Burchell, MC’ing. The Men of the Deeps, North America’s only Coal Mining Chorus, was invited to perform throughout the ceremony. The event also included the placing of the wreaths in Davis Square at the Miner’s Memorial.